When planes or missiles are flying faster than the speed of sound, air to ground communication must be seamless, instant and protected; this is why the nation’s top defense agencies and contractors put their trust in NetAcquire telemetry and aerospace communications. NetAcquire systems offer cost-effective, rugged airborne data acquisition, processing, and recording capability. Many advanced functions are supported, including fully-networked inputs/outputs, real-time data analysis/reduction, on-the-fly reformatting, and data conversion. The NetAcquire architecture is highly scalable, offering multi-Gigabit throughput while maintaining very low processing latency. Flight ruggedization, testing, and validation includes extended temperature support(-40C to +85C), MIL-STD-810 (vibration/shock protection), MIL-STD-461E (EMI/EMC), and MIL-STD-704F (power immunity). 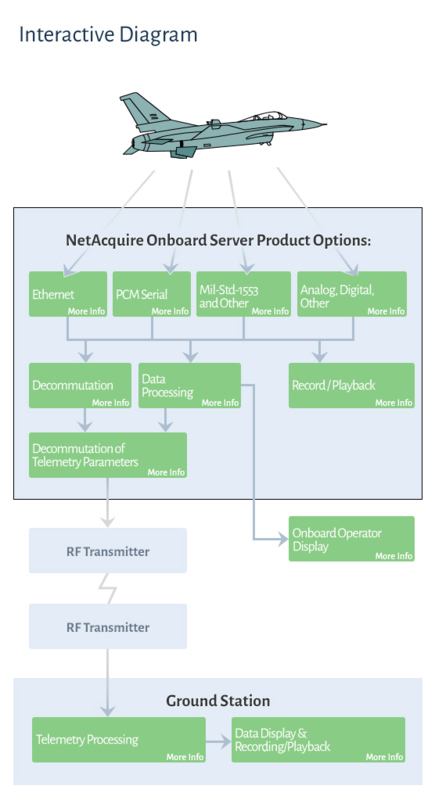 NetAcquire devices serve as ideal building blocks for creating vehicle data acquisition and control networks that allow two-way communication between sensors, recorders, processors, switches, gateways, and transceivers. All NetAcquire avionics nodes are completely configurable over the network and support real-time network commanding and statusing either on the ground or during flight. NetAcquire products are intended to interoperate with the emerging iNET (integrated network-enhanced telemetry) standards. Bidirectional network-to-PCM serial capability is available, providing seamless connectivity between airborne Ethernet and PCM telemetry/command links. Real-time processing offers data reduction that selects an automatic or user-defined subset of parameters to send over bandwidth-constrained RF connections.